The Dutch publisher of 12 Rules for Life made arrangements for me to speak at the University of Amsterdam on October 31 to about 300 students, hosted by the U of A’s Room for Discussion. I am somewhat loath, let’s say, to appear at a University, feeling about it much the same way as Jerry Senfield, Chris Rock and Carlos Mencia. These men — comedians all, accustomed to rough audiences — have all decided that it’s not worth it. The risk to reward ratio is just too high. It was like The Night of the Living Dead inside – a zombie apocalypse. All we could see through the opaque glass were the outlines of shadowy figures, scratching and crawling, as it were, to broach the building and feast on the minds of those entrenched within (like the hypothetical educators of the protesters had already done with their activist student avatars). None of the 900 attendees at that talk will ever forget it. About half an hour in, some devotee of Che Guevara mounted the second floor balcony and yelled some predictable slogans at the crowd. Two girls mounted the stage, briefly displayed a banned trumpeting the advantages of “smashing bigotry” and then departed down the central aisle, sprinkling the audience in some apparently Wiccan manner with some liquid everyone devoutly hoped was water. There is a well-documented account of one attendee’s broader experience here, as well, for those who might be interested. An hour or so later, when I departed, surrounded by campus security (well-meaning, but rather hapless when confronted by events of a seriousness outside their zone of expertise), the Che Guevara acolyte tracked me and those with me to my car, about two blocks away, screaming to the best of his ability inches away from my face, doing his best to provoke an outburst of exactly the kind of violent misery that his heart most intently desired (and that part of me very most definitely wished to provide). It takes about three days to recover from a series of events like that. So let’s say I considered the speaking engagement at Amsterdam with some apprehension. After all, I’m in a fortunate position, at the moment. I’ve booked almost 100 private theaters, most seating 2000 people or more, since my book, 12 Rules for Life, came out in January. The vast majority of those venues sold out. And the people who came and continue to come were and are friendly, welcoming and dead-set on participating in a serious discussion, philosophical, scientific and psychological. The events are positive in every sense, and free of all unnecessary stress. I have a good team managing the venues, and tracking my time. I have enough mental space to prepare a compelling lecture, and I try to say something different every night. It’s great. So when invited to a university, despite my still-intact academic position, I tend to feel the same as Seinfeld and Rock and Mencia: how can this possible be worth the trouble? But I have a talk scheduled at the University of Amsterdam, at the request of my publisher requested, and I am trying to do everything I can to make those who put time and effort into the foreign editions of my book (now numbering some four dozen) as pleased and as likely to be successful as possible. It’s all part of being an evil capitalist, bent on self-enrichment (more on that later). We might point out, first, that a guest whose attendance is requested in this manner is not precisely a guest at all, and second, that anyone who objects to anything I say for any reason is perfectly welcome to arrange a room and invite an audience and discuss anything they want to discuss – assuming they have the wherewithal to do so. 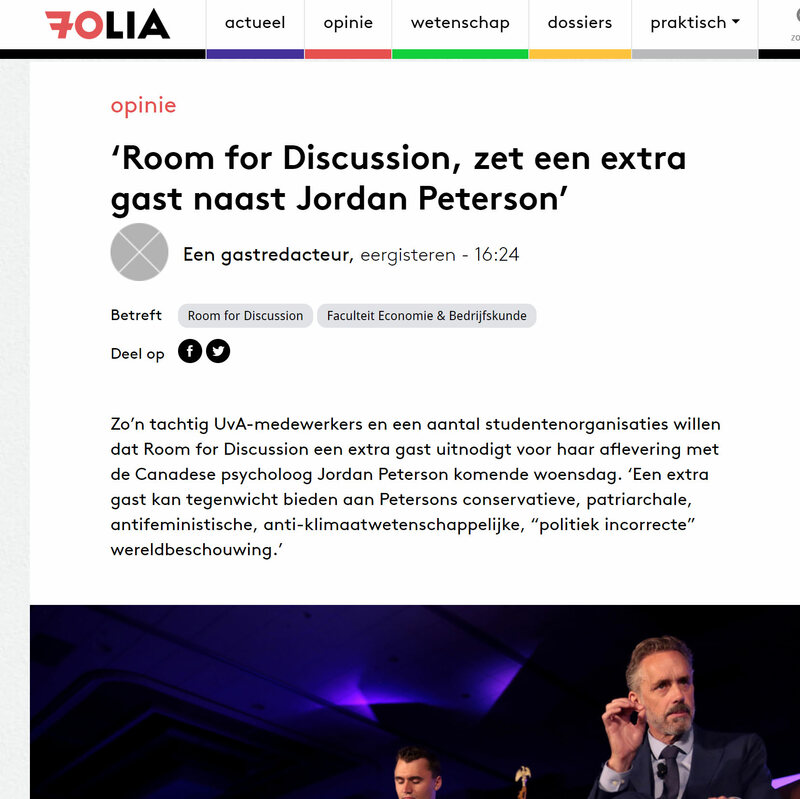 We, students and staff of the University of Amsterdam, appeal to Room for Discussion (RfD) to adjust the design of their upcoming interview with the Canadian psychologist Jordan B. Peterson. Peterson’s invitation is unbelievable and clashes with RfD’s self-proclaimed mission, namely: bridging the gap between the academic world and the general public by using a “journalistic, scientifically sound approach.” If Peterson already has a platform at our university, he must at least be accompanied by an expert discussion partner. We are happy to help RfD in finding a suitable candidate. In 2016, Jordan B. Peterson’s fame grew to an unprecedented level. Not groundbreaking research, but Peterson’s opposition to a change in the law underlies his current fame. In 2016, the professor spoke out against an amendment to the Canadian Penal Code and Canadian human rights law. The amendment, known as Bill C-16, added discrimination on the basis of gender identity to forms of discrimination already contained in Canadian human rights law. Peterson based his hostile standpoint on a fundamental misinterpretation of the change in law: he mistook Bill C-16 as a restriction on his freedom of expression. Peterson claimed that the amendment forced him to name trans and genderqueer students with their desired personal pronoun, something he systematically refused to do. Peterson spreads countless opinions that are both shocking examples of pseudoscience and outright harmful: from conspiracy theories to denial of climate change. Countless, apparently, but undocumented and unquoted: merely stated as fact. Why? Because I have no opinions that are “shocking examples of pseudo-science,” because I actually am a scientist and a good one with a stellar academic reputation, and I know the literature to which I refer. Conspiracy theories? Such as my claim, well-supported by organizations such as Dr. Jonathan Haidt’s Heterodox Academy, that the humanities and social sciences in Western universities are almost totally dominated by left and often radical-left leaning faculty? Do the research yourself, and draw your own conclusions. Like many other fake news, Peterson’s reading of Bill C-16 spread like wildfire on social media. Especially through videos on YouTube, the Canadian grew into a worldwide internet personality. Very popular were video compilations in which the professor is confronted by indignant students: the number of views of these videos is in the millions. In these compilations, trans and genderqueer students are often dismissed of the uninformed, militant rejection of the anti-discrimination law, set aside as ‘unreasonable’ and ’emotional’, while Peterson is placed on the pedestal of the ‘academic, rational mind’. One of the truly comical elements embedded in this paragraph (apart from the throwaway insistence that an opinion different from that of the writer is “fake news”) is the implicit suggestion that my viewers, readers and listeners or I have somehow produced videos dismissive of trans or genderqueer or other such students. But the truth of the matter is that the most popular of these videos (particularly the one that started it all, a cell-phone recording) was produced and placed on YouTube by the activists themselves in an attempt to discredit me). To say that attempt failed is to say almost nothing at all: the various versions of that video now online have garnered millions of views, with a 50:1 like to dislike ratio in my favor. I fail to see how that is manipulation on my part. And those who have recorded the campus activists’ behavior and placed it online for all to see are not portraying them as “unreasonable and emotional,” and placing me on the “pedestal of the academic rational mind” but merely allowing public evaluation of the situation as it unfolds. Right-wing media soon saw bread in Peterson and gave him a platform to talk about his general view of modern society. His conservative, patriarchal, anti-feminist, ‘politically incorrect’ statements were received with great enthusiasm by a rapidly growing crowd of admirers. These Peterson fans form a broad and separate relationship between right-wing conservative, ‘politically incorrect’, predominantly white, young men disappointed in society. His large number of followers provides Peterson with both academic legitimacy and financial gain; the professor earns $ 80,000 monthly through crowdfunding alone. Well, “right-wing” in this situation means “anyone opposed to the radical left.” According to a recent paper reviewed by the Atlantic Monthly, this is almost everyone (92%), including an overwhelming majority of the minorities whose interests are hypothetically served by the victim-oppressor narrative pushed by the same campus radicals objecting to my existence. It’s by no means a wise strategic move to deem everyone objecting to political correctness as “right-wing.” If you describe enough people in that manner, with enough insistence, for a long enough period of time, you may well shift the very meaning of the words. I know many people who have regarded themselves throughout their entire lives as liberal or even left-leaning who are seriously rethinking that self-description as the insistence that their moderate views are somehow right-wing grows. Plus, it would be all-too-convenient for the radicals if all those who opposed them (as I certainly do) to be card-carrying members of the alt-right, a vanishingly small group to begin with, because then what those opponents are saying could be washed away in the stream of indignant denunciation. But this is a tactic that is increasingly losing whatever utility it once possessed. At the time I objected to C16 (and, at the same time, in separate videos, the enforced use of “anti-unconscious bias training” at my own university (a stellar example of pseudo-science and conspiracy theory if there ever was one” and political correctness as such) I had also already posted some 200 lectures, which no amount of careful, even obsessive review by my erstwhile opponents could be transformed into something resembling a right-wing screed or biased presentation of the scientific literature. RfD simply invited Peterson because he is popular and “controversial”, not because of his expertise. It is worrying that Peterson can derive academic legitimacy from his status as internet personality. Peterson spreads countless opinions that are both shocking examples of pseudoscience and outright harmful: from conspiracy theories about ‘postmodern neo-Marxists’ who ‘infiltrate’ universities into denial of climate change. Peterson consistently shows that he has no idea of ​​issues that lie outside his own field. But even within his own expertise, that of clinical psychology, the professor can not be taken seriously. He regularly uses absurd, essentialist, sexist statements about human nature. Illustrative are Peterson’s views on ‘forced monogamy’, ‘social stimulation and cultural imprinting of monogamous relationships’. According to the Canadian, monogamy is the ideal remedy for combating men’s violence against women – as if domestic violence within a monogamous marriage never existed. Why should a reputable scientific institute such as the UvA, which has a reputation in the area of ​​research into climate change, offer a prominent platform to a notorious climate denier, who derives his fame entirely from a right-wing conservative ideology instead of [credible] scientific practice? With regards to my legitimacy: I have more than a hundred peer-reviewed scientific papers, as author or co-author (most often with my students, whom I most often encourage to take first authorship), with some ten thousand citations. This places me above the 99th percentile for documented influence among social scientists (ResearchGate places me in the top 2% of scientists overall, in terms of influence). I was a professor at Harvard, both Assistant and Associated, and tenured as a full professor at the University of Toronto, an institution whose psychology department is regularly ranked in the top five in the world. I’ll happily stack up my academic reputation and “expertise” against any of my erstwhile opponents at the University of Amsterdam, or anywhere else, for that matter. Of course, they regard such metrics as mere indicators of the patriarchal, tyrannical male-dominated racist neocolonial academic hegemony, but benefit from precisely the same hypothetically corrupt system. So I don’t think that this objection needs to be taken too seriously. For people in whom fundamental academic norms and values ​​are of paramount importance, the following is crystal clear: RfD simply invited Peterson because he is popular and ‘controversial’, not because of his expertise. This invitation damages the scientific standard that we try to meet in our daily academic practice. The arrival of Peterson is pure entertainment and anything but innocent. It is entertainment that fits seamlessly into a contemporary, international dynamic in which science and expertise are put into perspective as ‘just an opinion’. What goes on as ‘fact’ nowadays depends more and more on the noisiness and populism with which the ‘fact’ is presented. In times of alternative facts (alt facts), rigorous scholarship and critical thinking, core values ​​of the university, have gained renewed importance. These values ​​must be cherished, not undermined. The mere fact that most of those who are objecting to my existence cannot generate an audience that is not compelled to attend their lectures by necessity does not indicate that my comparative popularity is indicative of “pure entertainment.” And the supposition that those firmly committed ideologues who are opposing my views – who so often criticize science itself as nothing more than a Eurocentric, bigoted, power-hungry extension of the tyrannical western patriarchy – can so conveniently wrap themselves in this situation in the mantle of “rigorous scholarship, critical thinking” and scientific standards is laughable to a point well beyond absurdity. Really? The politically correct claiming their allegiance with objective science and rigorous scholarship? It truly is the case that truth can be stranger than fiction. Well, I seriously doubt it, but they are I suppose welcome to make the effort. That does not mean, however, that this so-called “guest” has any right to speak to an audience that has made the good-faith effort to come and see and listen to me, and not them. Where RfD has mentioned the event around Peterson ‘A Society in Crisis’, we think it is more appropriate to speak of a systemic crisis. This is the autumn of ten years since the economic crisis began and its end is still not in sight. People from the working class are forced to pay the bill for banks and multinationals. Geopolitical tensions are increasing and ruling elites react apathetically to the runaway climate change. We see Peterson – with his unscientific approach, his self-enrichment and his controversial star status – as a symptom of this crisis, not as the answer to it. 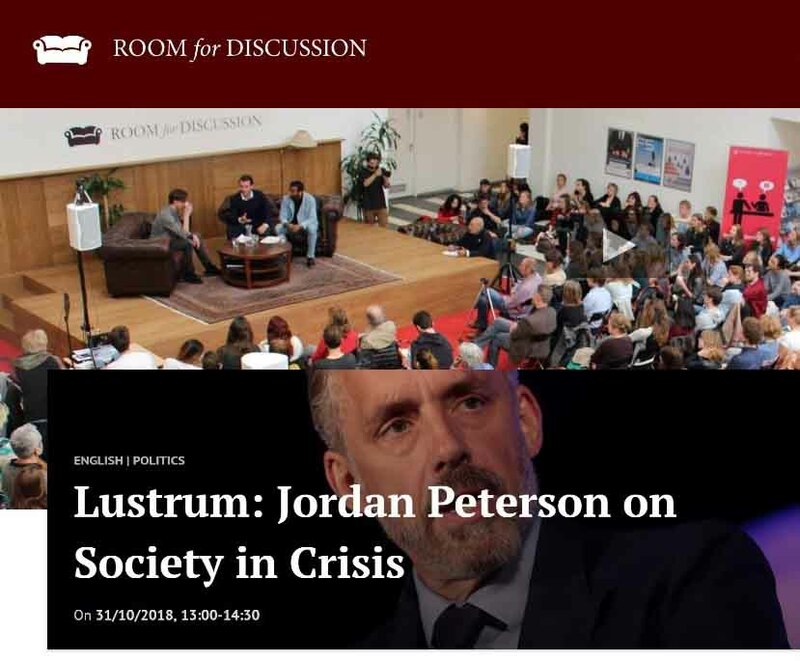 We would therefore like to see an extra guest being invited to the ‘Society in Crisis’ event, in order to counteract Peterson’s conservative, patriarchal, antifeminist, anti-climate-scientific, ‘politically incorrect’ worldview. Only then could a real, critical debate take place. Since Peterson has indicated several times not to shun the debate, we assume that space can be made for this. Most of this is generic radical left boilerplate, completing ignoring the news of unparalleled economic development around the world in the recent decades, including a 50% reduction in absolute poverty (reported even by the by-no-means-far-right Huffington Post); ignoring the fact that much of that reduction is a consequence of the spread of capitalist/sovereign-individual western ideas increasingly widely around the world since the death of the Soviet Union. The most comical element of this paragraph, however, is the complaint of the writer’s about my “self-enrichment.” First, I have never made any bone about my existence as an evil capitalist. If I am able to offer a service or set of services that people under no constraint whatsoever are pleased to purchase (such as the SelfAuthoring Suite and the Understand Myself personality test (note unselfconsciously blatant hucksterism here), then I regard that as one but not the only indicator of the value of what I am offering. I also presume that most of the signers of this document have or want a job, which will facilitate their own self-enrichment (and nothing involving slaving away at minimum wage, preferably). Finally, if any of these virtuous anti-capitalists would like to additionally enrich themselves, as I have done in my contemptible manner, they are perfectly welcome to run an extensive clinical practice, spend two decades striving to produce online mental health/psychological services that are both scientifically validated and practically useful, help identify promising entrepreneurs all over the world (see fi,co, with whom I consult), write a best-selling “self-help” book, or to tour around the world trying to find a receptive audience. The pathway to inconceivable but reprehensible riches beckons, you ladies and gentleman of superb academic reputation and intent: all that is lacking is your willingness and ability to walk down it. The open letter is an initiative of the network Worried Amsterdammers who is concerned about the emergence of the extreme right and normalization of his ideas. So, to the self-proclaimed “Worried Amsterdammers” – really, a tiny minority proclaiming themselves, per usual, as representatives of an entire community – we’ll see you at the University, despite my misgivings and the undoubtedly painful experience that will no doubt await me there. If I was primarily concerned with ease of life (and could control my obsessive curiosity) I would avoid it completely, but there is no bloody way I am going to allow your ill-informed faux-virtuous pathological compassion, and effortless careless indications of your purported moral, intellectual, scientific and academic superiority to stop me from talking to three hundred of your students. You’d just claim that withdrawal as a victory, when it would in fact be a consequence of sheer boredom with your antics (mixed with no small leaven of disgust at the same). And if you find someone who wants to oppose me, and who wants to speak, I honestly don’t give a damn. I firmly believe that if you had any ability and any courage you would host your own event. That’s what honorable people would do. But you can have it your way. But, for your own good, you’d better be a lot more prepared than you appear to be, by the evidence of your written objection to my appearance. I can’t see from that any evidence you know what you are opposing or why you’re opposing it. Unless, of course, the plan is merely to “protest” and to behave as dreadfully as your compatriots at other universities where I have been “invited to speak,” so that you can conveniently and effortlessly sidestep the necessity of directly confronting my ideas, presented in person. See you in Amsterdam, you cowards, denouncers and totalitarian wannabes. Note: Room for Discussion, who invited me, has apparently agreed to an additional 20 minute post-talk Q and A, but rejected the request for an extra guest.